The road signs are like driving with your father. Of course, Brazilians approach waiting in line with the fervor of the last child in a large family and the rate of traffic fatalities is incredibly high, so maybe there’s something to the father-figure act. They press forward, blind to well-meaning painted arrows and lines, directional signs, or any other traffic indicator, eager to grab what is theirs before someone else gets there. Maybe Father Government had his reasons to white-knuckle the dashboard. Motorized vehicles are still a bit of a novelty in this rural mining town. People still ride horses to market. A decade ago, everyone longed to own a bike. Now everyone works to own a motorcycle or a truck. The pedestrians demand their right of way with a bravado that makes me wonder if they understand that a ton of steel is going to win, every time. As a result, intersections have the following factors for your consideration: the traffic signal itself, the 10 pedestrians on the various curbs, two loose dogs, three motorcycles zipping between cars and pulling through your blind spots, and two oncoming cars that might or might not decide to follow the expected rules of transit. Obviously, this is not a land for pacifists. You cannot simply cruise along at the recommended speed. 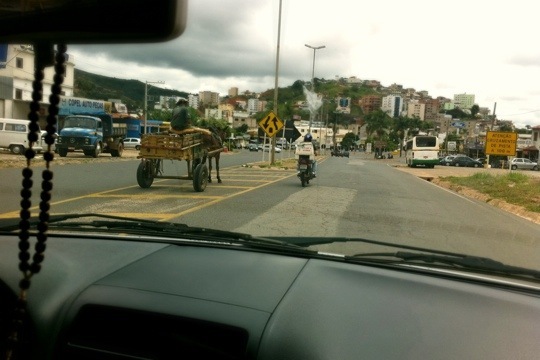 Driving in Brazil requires passion. You must match the traffic or perish. On downhills there are large, overloaded trucks with smoking brakes. On uphills there are road warriors from São Paolo determined to test the limits of their four-cylinder engines. There are pot-holes so deep and speed-bumps so high that they verge on geologic formations. This is the big leagues, people. Slam it into a lower gear for rapid acceleration, keep a toe on the brake, and never, ever drive with just one hand.